SAN FRANCISCO, CA— There is nothing more soothing to the spirit than to contemplate a Japanese painting. There is something awesome in a simple picture of a crane smoothly gliding over a golden cloudless sky or standing lofty on the stretched branches of a Bonsai tree, that fills the spirit with peace. Art in Japan is a perfect collaboration of man and nature and there is no better place to experience this fact that walking through the galleries of IN THE MOMENT, the Japanese Art exhibition from the LARRY ELLISON COLLECTION that is now in progress at the ASIAN MUSEUM in the City. Vicariously, the exhibition transports its visitors to Japan. They can see the interior of a Japanese house, its furniture, and even observe its owner going through the traditional custom of changing her scrolls on the wall, and the flowers inside a small vase on a table. In Japan, the houses' arrangements correspond with the changes in the seasons, so during Spring, for instance, the Japanese display their scrolls showing Spring flowers, and place Spring flowers’ in their vases. During the Winter, they unroll their Winter scrolls with snow paintings and hang them on their wall to be displayed, and fill their vases with bare tree’s branches to replace the Spring flowers. There are many fascinating objects in the exhibition, but the most outstanding work of all belongs in the wood-carved collection. 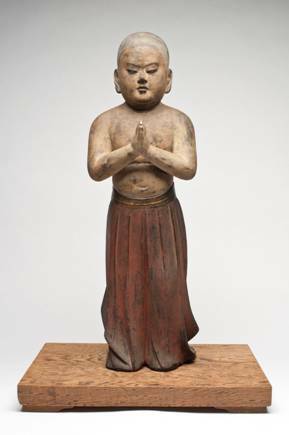 It is the standing figure of SHOTOKU TAISHI, a 27 ½ inches lacquer on wood statue of a boy, with crystal inlay. belonging to the Kamura Period ((ll85-l333). The catalogue explains that the figure depicts the moment, during the Tenth Century, when the Prince (age two) took two steps, and facing the East called out to praise Buddha. The “Prince praising the Buddha” as the statue is called, represents the man who ruled Japan on behalf of his aunt, the Empress Suiko (593-622). The ELLISON COLLECTION displays 25 works which include the entire range of production of religion art in Japan from the l9th Century in the forms of Buddha, Shinto gods, Bodhisattva and animals. Most of the objects displayed in the exhibition belonging to the KANO SCHOOL. Founded by KANO MASANOBU ( 1434-l530). The school was a workshop of blood-related artists who mastered a wide range of subjects and fused Chinese and Japanese methods of painting. The perfection in all their paintings and objects was made possible by the hierarchical studio system. The school first produced Buddhist images, landscapes, monochrome ink images and pictures depicting native scenery of Japan, but by the end of the XVI Century, the KANO painters dominated all fields of images. Using time-honored techniques to make objects suited to the demands of a global economy, several artists also began adopting Western artistic styles. 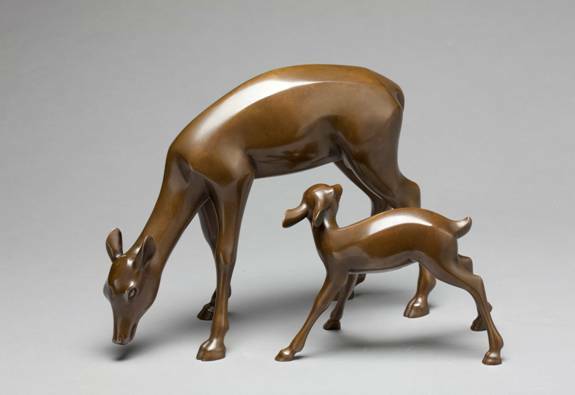 The above statues of a doe and her fawn, dating for l930, represent the style. It is painted on a pair of six-panel folding screens (byobus) using ink and gold painting on paper. The work belongs to de Edo Periods (1615-1868) in the XVIIth Century and it is scattered with different color decorated fans. Mr. ELLISON, who owns the collection, emerged into the world of High tech in the late l970 as the cofounder and CEO of Oracle Corporation. Among his love for cars, airplanes, Real Estate and sailing, he is also interested in Japanese Art. His interest in Japanese Art started when as a Chicago College student he started going to the library of the Art Institute of Chicago, to do his homework, and began wondering its galleries. His love for this Art, from the feelings and emotional reaction that he experienced when looking at their pictures. Mr. ELLISON became more touched by the Japanese Art and its aesthetics when he was sent to work in Japan and got the chance to visit the city of Kyoto where he visited the gardens at the Heian Shrine that he got to know more closely in the course of many trips. It was the effect of these gardens that made him want to live surrounded by a Japanese garden. He does now. For those interested in looking at a Japanese garden, the exhibition shows a short video of a beautiful Japanese garden with bridges, waterfalls, flowers. It looks so peaceful that just by watching it on the video, one feel completely relaxed.